Monmouth Center for World Religion and Ethical Thought sponsored a panel titled “Weaving Peace: What We can Do” as a part of celebration of the 2008 United Nations Peace Day on Saturday, Sep 20, at the Unitarian Universalist Congregation Meetinghouse, 1475 West Front St., Lincroft. Dr. Nuray Tugrul Yurt of Interfaith Dialogue Center (IDC) spoke of the importance of all dialogue activities for the betterment of the society in all levels. She offered examples of various IDC initiatives and asked for further interest in IDC activities all over NJ. 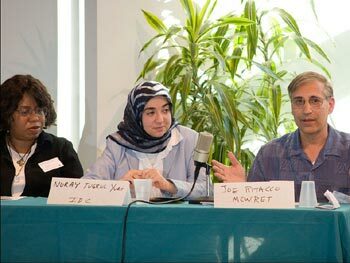 Besides IDC, there were six other 'like-minded' organizations represented on the panel moderated by Joe Ritacco.